Reading aloud shouldn’t be left to that few minutes before lunch. Richard Allington, in his ASCD article Every Child, Every Day, states that students should listen to a fluent adult read aloud every day; it is an essential element of reading instruction in classrooms. As a principal, I try to model this practice. My teachers schedule me in to read aloud in their classrooms for half hour time slots, anywhere from twice a week to once every two weeks. Classroom time is important, so my visits should be connected to learning. What helps are the learning targets posted on the board. As I visit classrooms, I can see the concepts being taught. This information gives me ideas for books that would work well with what students are studying. For example, poetry is a focus at 4th grade, which led me to read aloud Where the Sidewalk Ends by Shel Silverstein. The first book I share usually rhymes, has a beat, is a captivating story and/or is short. These are the “can’t miss” stories, books that are guaranteed to capture the students’ attention. 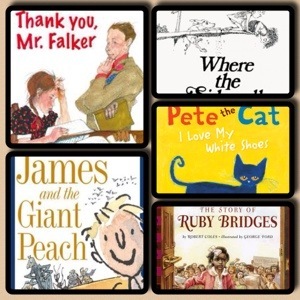 Titles that come to mind include Pete the Cat by Eric Litwin and Neville by Norman Juster at the primary level, and Thank You, Mr. Falker by Patricia Polacco and The Wretched Stone by Chris Van Allsburg for intermediate grades. Teachers know that every class they inherit is different from year to year. To get a read on my new listeners, I pay attention to how the students respond as I read aloud to them. I use formative assessments to alter my instruction for learning. A great resource about formative assessment is Checking for Understanding by Doug Fisher and Nancy Frey. Strategies they recommend include noticing nonverbal cues like puzzled looks and boredom, as well as having student “Think-Pair-Share” during the story. Classroom success comes to those prepared. For me, I don’t read aloud a book to a classroom until I have read it myself. This is the best way to determine if it will make a good read aloud. Did I have a hard time putting the book down? Would I recommend it to others after I finished it? Was it character or story driven? If I don’t have time to do this, I often refer to The Read Aloud Handbook by Jim Trelease. It has great recommendations for read alouds as well as research and tips for supporting this practice. I have also nixed books I had high hopes for, but realized it is more of a read alone story upon review. Unfortunately, some kids enter school without a lot of stories read aloud to them. This is evident when we assess our five year olds and too many cannot even recognize sounds and letters. To expect kindergarteners to sit through twenty minutes of James and the Giant Peach on the first day of school may be unrealistic. Once I have Started Small (#3), I recognize their growing abilities to listen to stories with specific comments such as, “Wow, you sat for ten whole minutes while I read you A Day’s Work by Eve Bunting!”. For more on building reading stamina, check out The Daily Five by Gail Boushey and Joan Moser. Just because a book is an award winner doesn’t mean it will make a good read aloud. In fact, many of my favorites don’t have this recognition. I get recommendations from colleagues, local bookstores and on Goodreads. These experts help me find stories that have short chapters, limited dialogue, interesting plots, and characters kids can relate to. I also read aloud nonfiction and informational text. 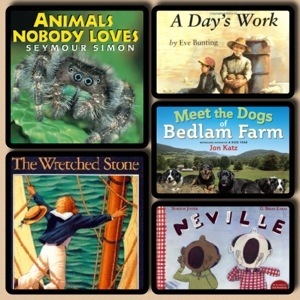 Two of my favorites are Meet the Dogs of Bedlam Farm by Jon Katz and Animals Nobody Loves by Seymour Simon. 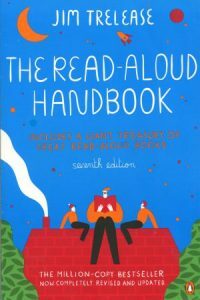 In Strategies That Work, Stephanie Harvey describes the process of introducing the think-aloud (a guided version of reading aloud). The idea is to get students thinking during the story, not just at the end. Reading a book cold doesn’t activate students prior knowledge, which is necessary for getting the most out of it. I start a story by first reading the title and the author’s name. Next, I might ask an open ended question related to the book or do a picture walk and make predictions. This modeling creates a bridge to developing independent readers. As I read, I give opportunities for students to predict what may happen next, ponder a question, or make an interesting observation. Once completed, we go back to how we started. For example, when I have read aloud The Story of Ruby Bridges by Robert Coles, the students and I first discussed what “courage” means. I collected their responses and started the story. As I read, I asked students to identify examples of courage and marked that text with a Post-it note. At the end, we took our notes and revised our previous definition as a whole group. Other fun ways to wrap things up are writing a book review and doing book talks on stories in the same genre or by the same author. No doubt there are days when I feel like I don’t have time to get into classrooms and read. That is why scheduling it in my calendar is so critical. I also remind myself of all the benefits: Kids are introduced to authors and stories that might not otherwise have been exposed to, both students and teachers see how much I value literature, I am able to stay current on what kids are reading, and I connect with students in a positive and fun way. I cannot think of many things I do as a principal that are more important than sharing myself as a reader in school.